Successful negotiations are not always about winning, they are mainly about getting the best long-term outcomes and frequently about making sure that the other side walks away with something as well. These are some of the central messages of the three-day Winning Negotiation Strategies course running at the UCD Michael Smurfit Graduate Business School next month. The second day of the programme involves analysis of what worked and what went drastically wrong as well as exploration of dealing with situations such as employment disputes that can become quite emotionally charged. After that the wrap-up brings everything around to practical application. 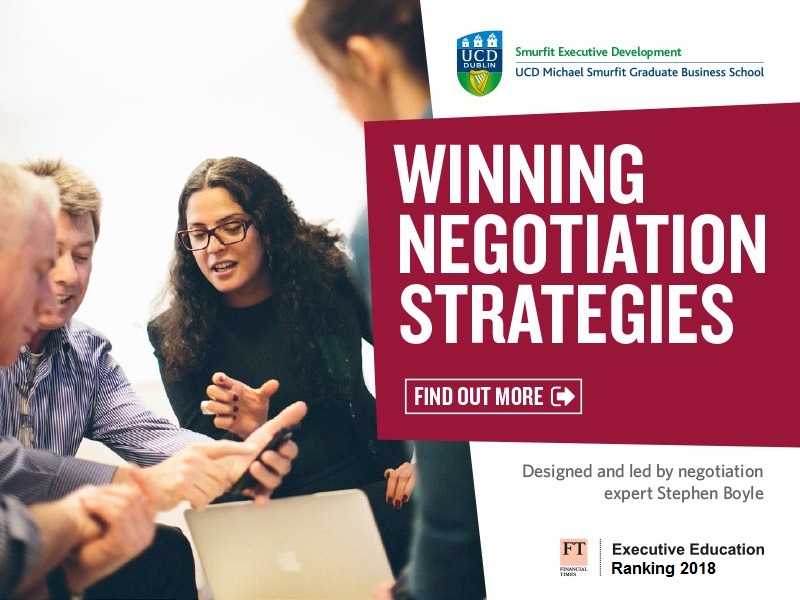 Stephen Boyle is a lecturer in negotiation and programme director of a three-day Winning Negotiation Strategies course at UCD Smurfit Executive Development. The next course runs on April 2nd to 4th. Visit www.smurfitschool.ie/executivedevelopment for more information.